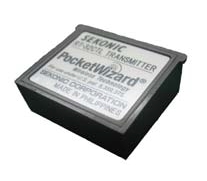 Sekonic are bringing out the RT-32CTL Radio Transmitter module, which makes their light meters compatible with PocketWizard ControlTL radio channels. Leading light meter manufacturer Sekonic are releasing the RT-32CTL module, a wireless radio transmitter unit that plugs into the L-358 and L-758 series meters to make them capable of triggering PocketWizard ControlTL receivers. The RT-32CTL is an optional module for the L-358 FlashMaster, L-758D and L-785CINE. It is integrated into the L-758DR DigitalMaster as standard. Using it, photographers can accurately measure flash output for setups created using the PocketWizard ControlTL system in manual Power Control mode. Compatible with the PocketWizard Plus/II/III, MultiMAX, FlexTT5, ST4 and MC2 receivers, the RT-32CTL provides control of ControlTL Zones (A, B, C) and Quad-Triggering Zones (A, B, C, D) directly from your Sekonic flash meter. A firmware update is required to access the new features, which can be installed by customers using their meter’s mini-USB port. There will be different versions for European (CE) and North American (FCC) markets using different frequencies. Release date is set “at the beginning of March 2012”, i.e. imminently. Sekonic will offer an “upgrade path” for customers who recently purchased their wireless flash meters. Visit the Sekonic web site for more information.